Coach Alisa Cairns, third from left, shares the spotlight with team members, from left, Claire Kelly, Lola Fisher, Jameson Roller, Travis Booth, Jake Levine, Trey Lockhart and Zack Levine. Photo courtesy LBHS Surf Team. against J Serra Catholic High School in the Scholastic Surf Series at Ninth Street in Huntington Beach last month. Four out of the six boys in short board made it to the finals. Jake Levine took the win with Trey Lockhart as runner up. Zach Levine finished in third and also jumped into body board when he was needed, taking second on a rented board. Travis Booth was a standout throughout the day and finished in fourth. 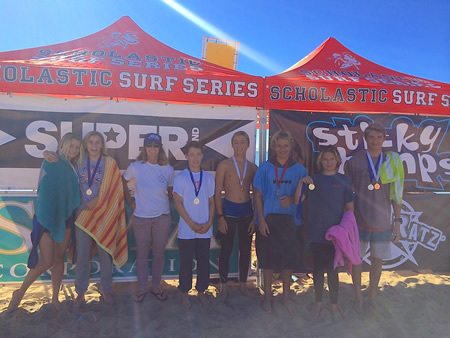 Jameson Roller and Lola Fisher both were impressive in the long board competition and each finished as runner up in the boys and girls long board divisions. Claire Kelly also surfed well and finished fourth in girls short board. The team next competes Dec 20.